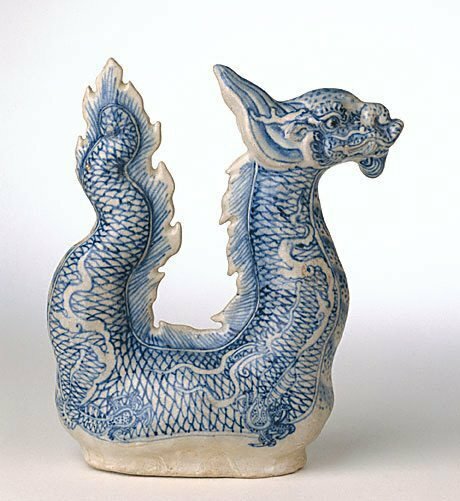 Associated with the aquatic aspects of creation, dragons are central themes in Vietnamese cosmology and it was believed that fish of great age transformed themselves into dragons capable of flight. The Ly dynasty named its capital Thang Long or ‘rising dragon’. 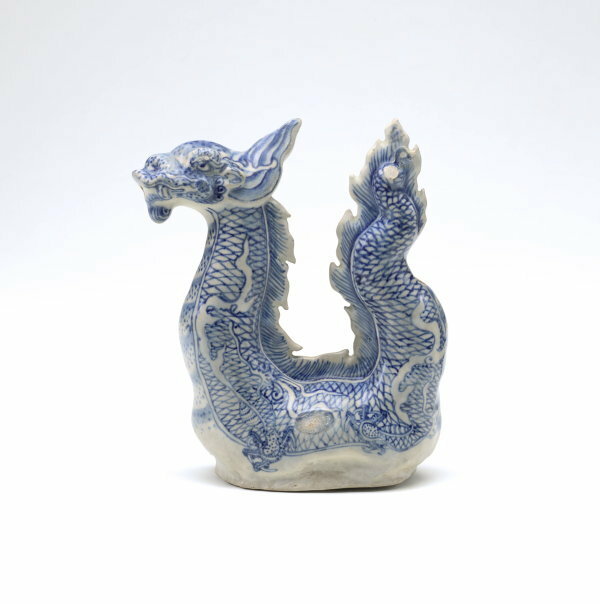 The dragon has a ubiquitous presence on Vietnamese ceramics, where it appears painted in underglaze blue, applied as unglazed relief decoration and, less commonly, in moulded shapes as on this fantastic pouring vessel. The ewer has been made from a two-piece mould with the parts luted together along a vertical seam with the dragon details realised with spirited brushwork. It was part of the important Hoi An hoard of over 150,000 ceramics, the cargo of a sunken ship found near the historic port of Hoi An near Da Nang in Vietnam and brought to public attention through controlled excavations carried out from 1997 to 1999. Interestingly a similar dragon vessel was documented (in a 1979 Oriental Ceramic Society of Hong Kong catalogue) as having been excavated with a fine gold chain around its neck from a grave on the southern coast of the Indonesian island of Sulawesi in 1972. The Asian Collections, AGNSW, 2003, pg.302. John Guy, Orientations , 'Vietnamese Ceramics from the Hoi An Excavation: the Chu Lao Cham Ship Cargo’, pg. 125-128, Hong Kong, Sep 2000, 125-128. Terry Ingram, The Weekend Australian financial review , 'Vietnamese treasure rises to the occasion', pg. 41, Sydney, 11 Nov 2000-12 Nov 2000, 41 (illus.). One of the three dragon ewers from the Hoi An Hoard is illustrated. Jackie Menzies, TAASA Review , 'The Nanhai Trade', pg. 4-7, Sydney, Mar 2004, 4, 5 (colour illus. ), 6, 7. Connell Nisbet, Look: 1953-2003 celebrating 50 years , 'An ongoing affair' compiled, pg. 26-27, Sydney, May 2003, 27 (colour illus.). Ann Proctor, Look , 'Vietnamese ewer joins the Asian collection", pg 8, Melbourne, Aug 2001, 8(colour illus.). The Asian Collections Art Gallery of New South Wales , Sydney, 2003, 302 (colour illus. ).